Frankly, I didn’t know an alternative existed until I started looking and asking around. Some very smart person realized that training wheels really just helped your child to pedal, versus balancing which is actually the more challenging part of the act. They reversed the learning order and said, if a child learned to balance FIRST, then the pedaling part would come easy. Seems they are right. Most versions of the balance bikes out there have received very good reviews. 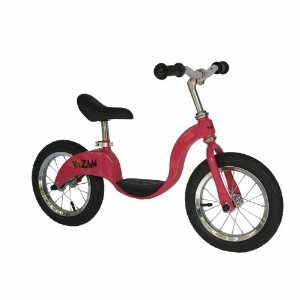 I chose the Kazam balance bike because it has real tires and a bigger foot rest for the little feet. The Strider bike is the most popular if you are interested in a different option. The bike is just tall enough so your child’s feet touch the ground – so they push themselves along with their feet and lift their feet to glide along. In doing this, they begin to feel comfortable with the concept of balancing on the bike. Its one of those things that if it had been on Shark Tank, they would have given them millions. So cool. We have seen it in action and it is not without risks- the child can still tip over and they do have to use their feet to stop so you need to avoid any hills at first. It is a nice teaching tool and in my opinion much better than the run behind and cautiously let go and watch your child wobble towards an unknown destiny of euphoria or pavement. You can find this bike on Amazon for around $100.